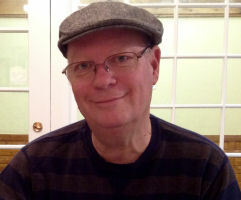 Gilbert Lessard is a five generation artist. His grandfather painted landscapes and nature scenes. His grand daughter loves to paint portraits in pop art style. Gilbert enjoys painting landscapes and automobilia in a photo-realistic style. Scenes for landscape paintings are chosen mainly from the Eastern Townships of Québec, and automotive subjects are from car exhibitions attended throughout North America. Realistic rendition of reflections in chrome is one of his specialties. Landscape paintings feature bright skies and sun lit scenes which draw the viewer's attention in, calling into mind personal experiences enjoyed in similar settings. Gilbert Lessard's artwork has often times been described as 'happy paintings' that reflect the wonders of God's creation, in a minute way when compared to the real thing.